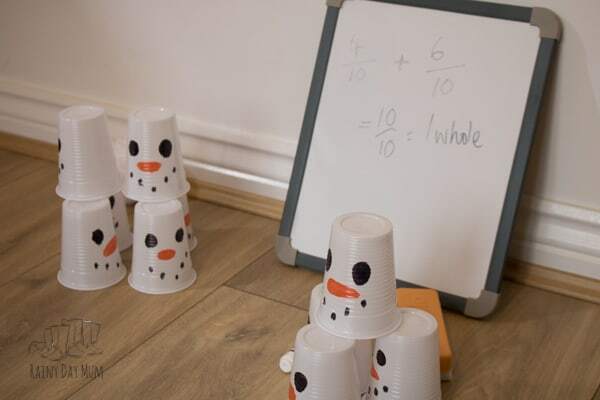 One of the topics that children can find challenging in mathematics is fractions especially when it comes to adding and subtracting fractions. 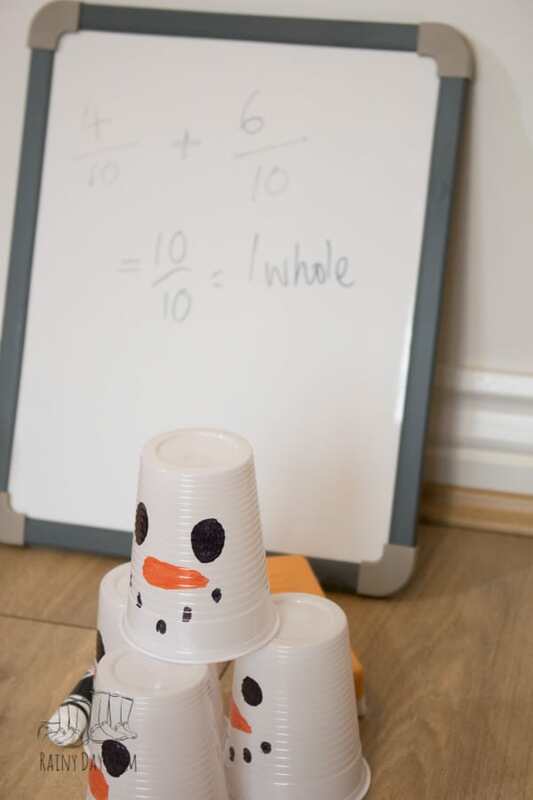 This hands-on maths game is ideal for working with the addition and subtraction of fractions with the same common denominator. The common denominator that we chose was tenths and worked primarily at adding fractions less than or equal to a whole and subtracting fractions from a whole. 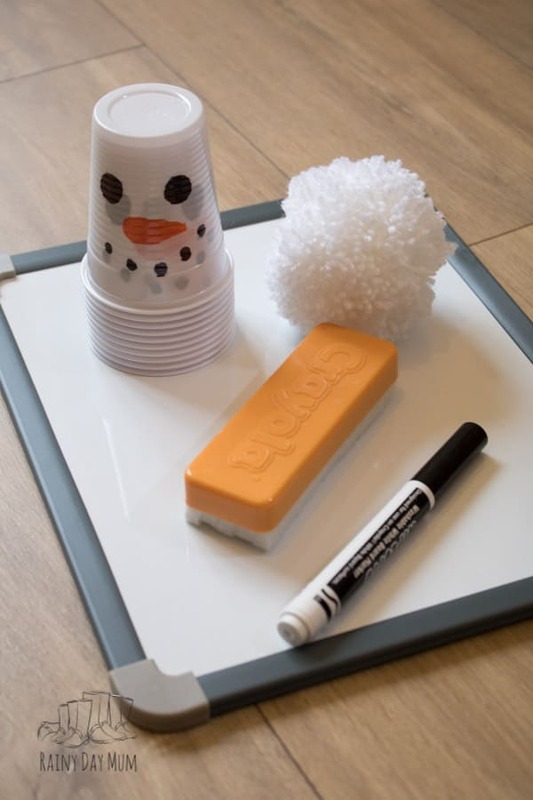 So here’s a simple winter-themed fractions game for some hands-on addition and subtraction of fractions with the same denominator. 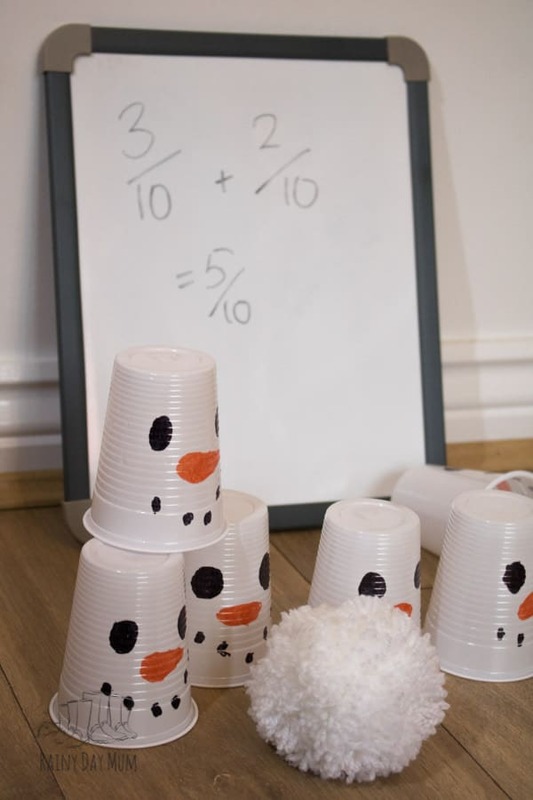 Work on Fraction Equivalency with our Pumpkin Pie Fraction Snap Game available to download or purchase from our store. 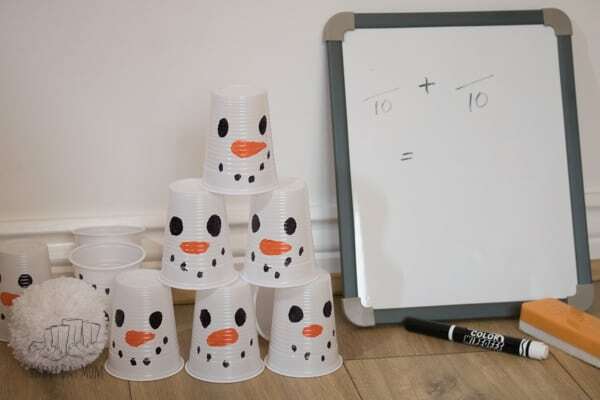 On the 10 cups draw a simple snowman face – so that they balance you need to have the base of the cup at the top. I used a black and an orange sharpie and drew on two large eyes and then some black dots for the mouth. Plus a “carrot” shaped nose. 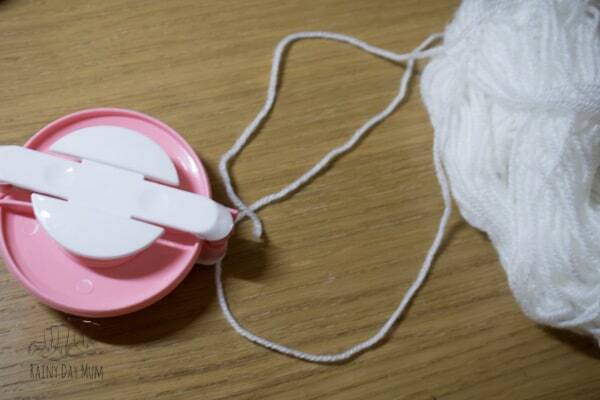 You could use a ready-made pom pom but with one of our pom pom makers, I created a white snowball that we could use in the game. 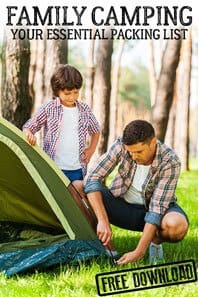 This game can be played in a single match with 1 person, or you can play a set of games or multiple players – see the instructions for different games below. 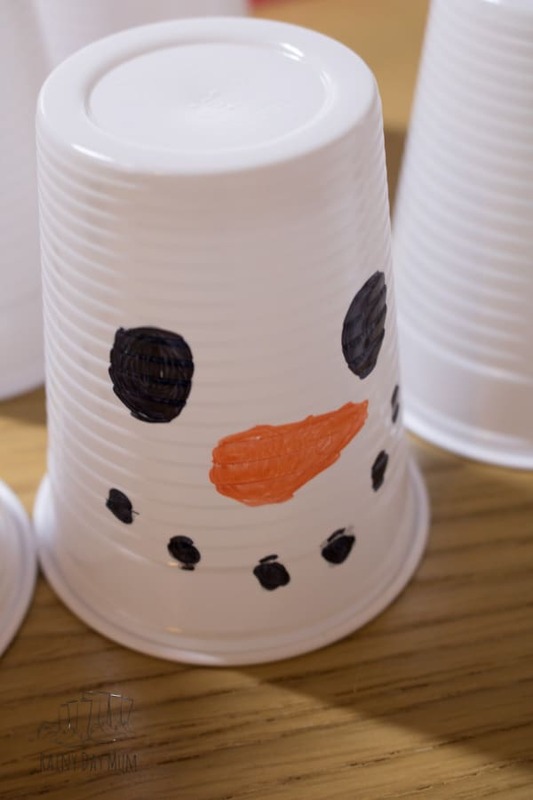 Set up the cups with 4 snowmen on the bottom, 3 on the next row, 2 the row above and 1 at the top. 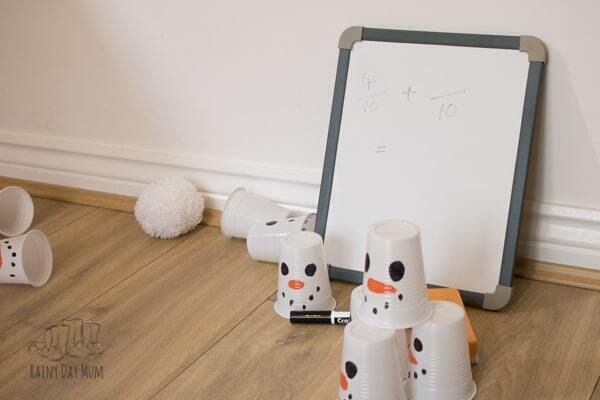 On the whiteboard write the two throws that you will be having as a fraction see the images. 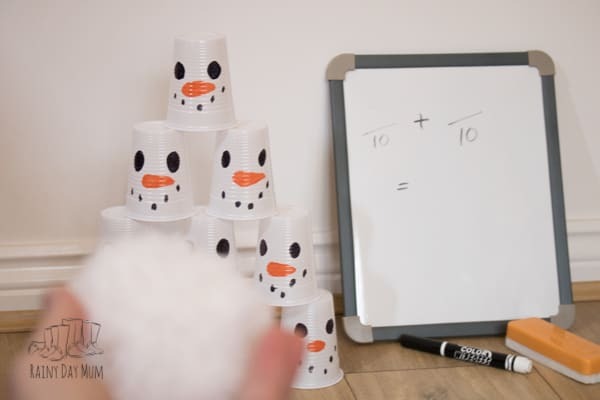 Throw the snowball to knock down “some” of the snowmen – the objective is not to knock down all of the snowmen at once or over the two throws. 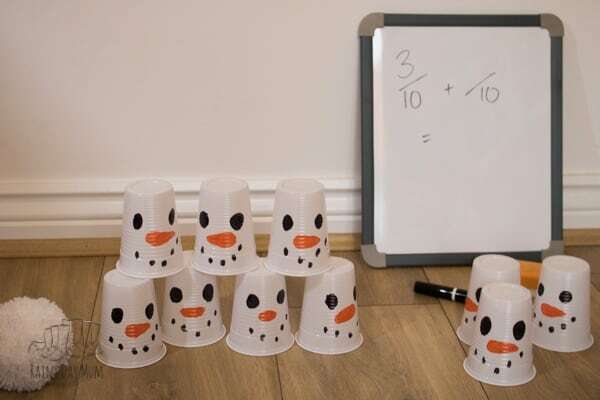 Record the first throw as a fraction of the 10 snowmen on the whiteboard and carry out the second throw. 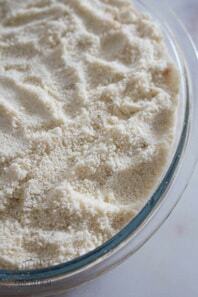 Now add the 2 fractions together. 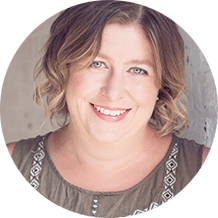 The common issue when children start adding the fractions is that they add both the numerators and the denominators so you could end up with an answer like 8/20 if they have knocked down 2/10 and 6/10. Using a game like this you can ask them to check their answer. 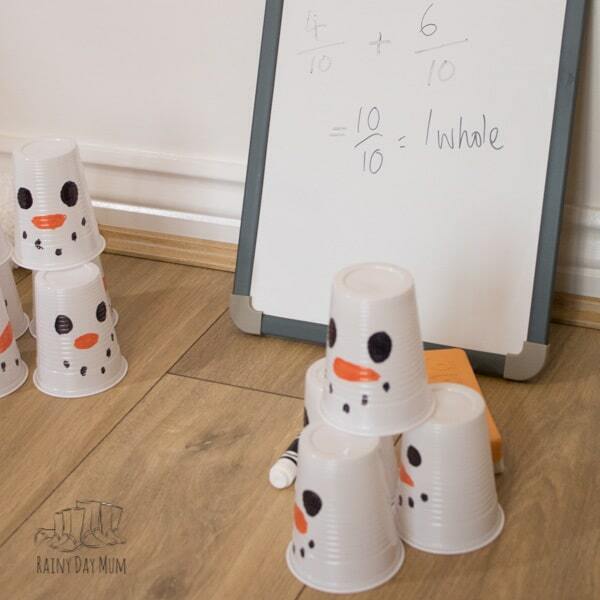 Count how many snowmen they have knocked down in total… this answer will be correct and then count how many snowmen they have with the ones that they have knocked down and the ones left standing. 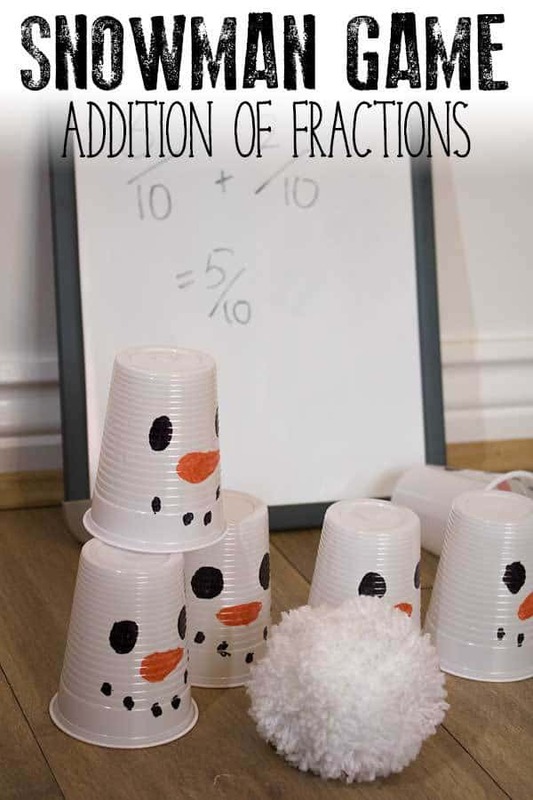 As you play this and other hands-on activities and games for adding fractions with the same common denominator they will get more and more used to only adding and subtracting the numerator. In this version a single player will play multiple rounds of the game as above recording the score as a fraction for each game – they will then add they rounds together. 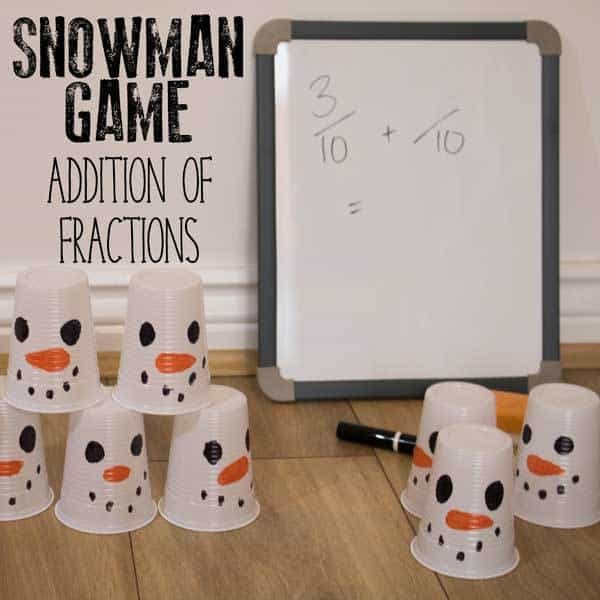 Unlike the single round game, this works on the addition of fractions over the whole but still uses the same common denominator. 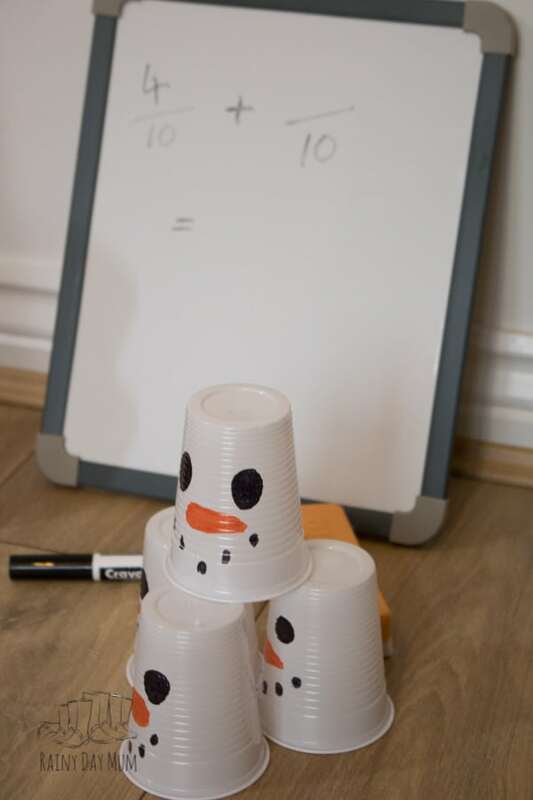 A two player game is played the same as with single players, taking turns to knock over the snowmen. Playing two or more players gives an ideal opportunity to work on fractions looking at which fractions are bigger and which fractions are smaller as you determine the winner. 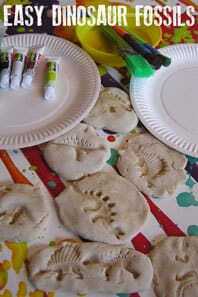 You could also do some subtraction of fractions as you work out by how much the winner has won.